The Chocolate Muffin Tree: Chocolate Chocolate-Chip Muffins....and the story behind the name! Chocolate Chocolate-Chip Muffins....and the story behind the name! Put flour, baking powder, baking soda, cocoa, sugar, and 3/4 cup of chocolate chips into a large bowl. Pour all liquid ingredients into a bowl. Mix the dry and wet ingredients together. Spoon into paper muffin cups. Sprinkle the remaining 1.4 cup chocolate chips on top and make for 20 minutes or until muffins are dark, risen and springy. Enjoy! Do you think I should use this for a logo or symbol for my blog? Let me know your input. What do you think A Chocolate Muffin Tree looks like? Where Does the name "The Chocolate Muffin Tree" come from? 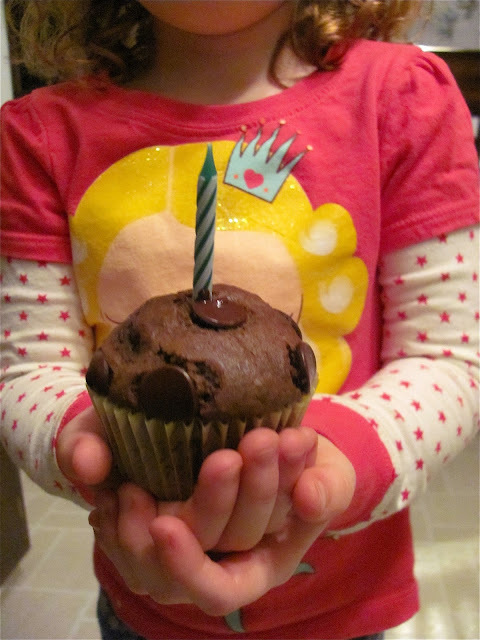 Answer: After celebrating her 4th birthday with chocolate muffins, my daughter said to me while at our garden, "We could plant an apple tree and a chocolate muffin tree! 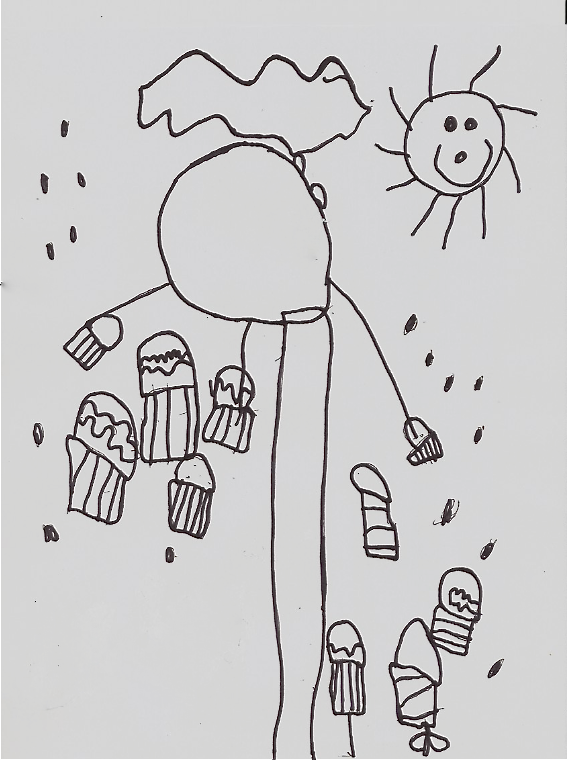 No, I want to grow A Chocolate Muffin Tree!" Six months later I remembered this story when trying to think of a name for my blog and the rest is history! Happy blogaversary! We have loved this past year and are looking forward to the next! I love the story behind the name, and can't wait to make the muffins! so sweet, I LOVE her picture! Can't wait to try these muffins - my girls are big fans of chocolate & baking so it's a sure hit around here! Happy blogiversary! The muffins look delish. Very cute story. I pinned the recipe to try one of these days. I'd always wondered - wonderful story!! Many Good Heartfelt wishes to you and Cassie on the 1 year anniversary of The Chocolate Muffin Tree, I have enjoyed visiting, and as well getting to know you!! 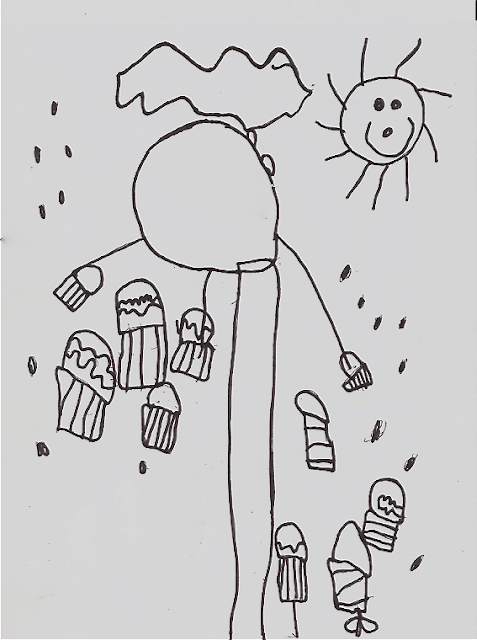 Yes, I do think that Cassies' drawing would make a wonderful logo - it's exactly how I would think a chocolate muffin tree would look! I enjoyed the story of how you found the name, and this is such a good childhood story - so often me and the children at the daycare center where I work, talk about growing our apple and orange seeds, I can see this conversation between you and Cassie so clearly!